Wow. Christina Henry sure can write! This is only the second book of Henry’s that I’ve read, but both have made a real impression on me. 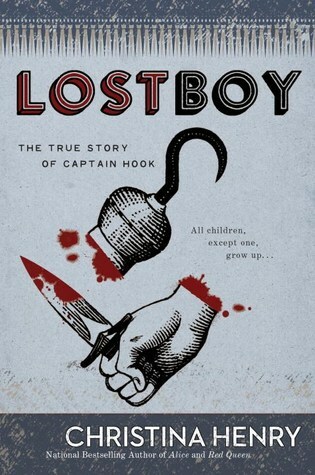 Lost Boy is “The True Story of Captain Hook” so it’s not really much of a surprise who the narrator of the story is, but Henry weaves a magical tale here, re-imaging the Peter Pan mythos and in the tradition of great rivalries, Peter Pan and Captain Hook begin as the best of friends. It is Peter, in Henry’s telling, who has a darker side and creates Hook, or rather turns his first ‘lost boy’ (the first boy Peter brings to the island) into a man who hates everything that Peter stands for. Jamie, who will become Hook, is Peter’s ‘Number One’ – the boy who trains the new boys, who makes sure that everyone is fed and well prepared for whatever mischief Peter wishes to get into. He was also the first boy who Peter ever brought to the island, and while other boys have died, fighting the pirates or by other means on the island, Jamie has always remained safe, tough, and first for Peter. Through a series of events, carefully brought before the reader, Jamie begins to lose his affection for Peter. He begins to realize that Peter has no concept of right and wrong or life and death. If a boy dies fighting the pirates, then Peter will just go to ‘the other place’ and bring back another down-trodden boy to fill the gap. But Jamie realizes that Peter has made a mistake when he brings back the very young Charlie. Unlike the other boys Peter’s found, Charlie has a mother who is likely missing him and searching for him. When Peter wants to simply discard Charlie, Jamie takes him under his wing and will even challenge Peter in order to protect the young boy. There is SO MUCH going on in this book – subtleties that might be missed by some readers – and connections to the J. M Barrie story/play that make this feel just so right. It is definitely a dark book, with boys dying with some alarming frequency, and we see Peter here as a bit of a monster. And yet, when Henry writes it, we see just how correct she is. How looking at Peter Pan from just a slightly different vantage point, sheds new light on the story. This is just powerful storytelling and I recommend it highly. Looking for a good book? Lost Boy by Christina Henry is a beautiful, dark story of Peter Pan and the creation of Captain Hook.